The PMI data from both the US and the UK is released today but it won’t influence GBPUSD much. 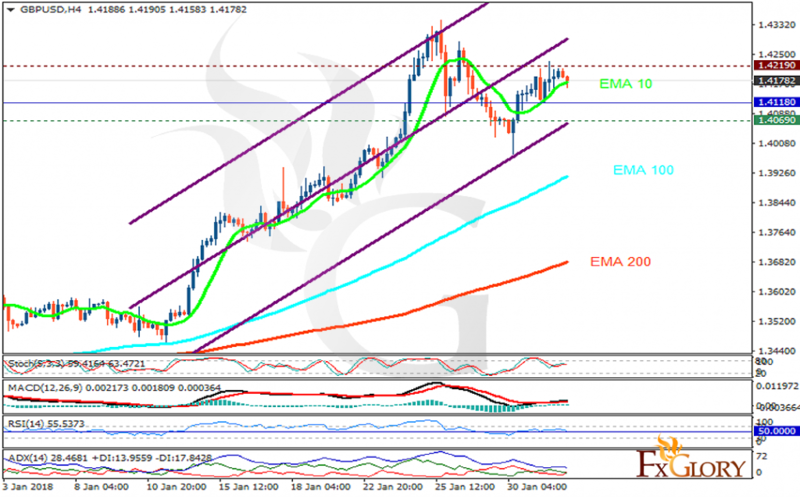 The support rests at 1.40690 with resistance at 1.42190 which the weekly pivot point at 1.41180 is located in between the lines. The EMA of 10 is moving with bullish bias in the ascendant channel and it is above the EMA of 200 and the EMA of 100. The RSI is falling towards the 50 level, the Stochastic is moving in high ranges and MACD line is above the signal line in the positive territory. The ADX is not showing any clear signal. The resistance level breakout will pave the way for further growth towards 1.43 otherwise the pair will start its correction pattern and drops to 1.38.